Sleeping Bear Press, 9781585361489, 40pp. Illustrated by Barbara GibsonBursting with history like no other city in the world, Washington DC is a tribute to the United States, its people and even the world. Monuments spot the landscape, tourists spot the monuments and their legends are learned. The story of DC doesn't stop there. Look beyond the monuments. That's exactly the Washington DC readers will discover with N is for our Nation's Capital: A Washington DC Alphabet. From Abigail Adams to the National Zoo and all the cherry blossoms, flags, houses and presidents in between, N is for Our Nation's Capital is like a field trip in a binding. Rhymes capture readers' interest and expository text expands on those points and others with little-known but fascinating facts. Did you know the cherry blossom trees that are an integral part of DC's scenery were gifts from Japan? Or that Mrs. Taft planted the first two? Readers will eagerly turn the pages to learn more true facts like these. Wonderfully written in engaging rhymes for young readers backed with expository text that reveals even more for the more inquisitive reader make N is for our Nation's Capital the perfect keepsake and tribute to Washington DC. 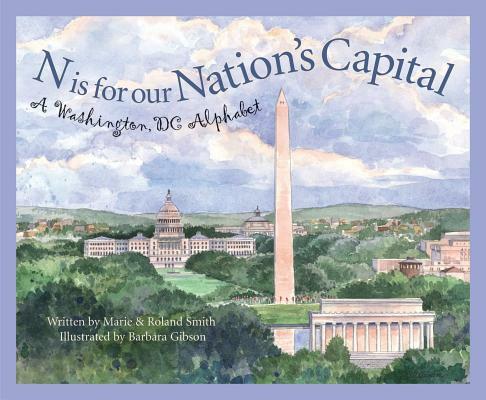 Authored by the husband and wife team of Roland and Marie Smith and backed by Barbara Gibson's stylish illustrations, N is for our Nation's Capital is a perfect fit on any bookshelf. This great exploration into our country's nerve center will have teachers and parents excited and help introduce one of the world's most important cities to children from sea to shining sea.